If you have been to Anime Festival Asia 2013 & Anime Festival Asia 2012 Baby Metal should be all too familar. In 2010, BABYMETAL (Comprise of SU-METAL, MOA-METAL, and YUI-METAL) was formed. When their first music video "Doki☆Doki Morning" debuted on Youtube, the initial shocking reaction it created was, "What did I just watch?!!" A unimaginable combination of HEAVY METAL and KAWAII IDOL, through word-of-mouth, they began to gather more and more fans (metal fans and idol fans alike), accessing from all over the world, such as North America, South America, Europe, and Asia. In August 2012, they performed at one of the biggest music festivals in Japan, "SUMMER SONIC 2012", and became the youngest artistes (at average age of 12) ever to perform at SUMMER SONIC. 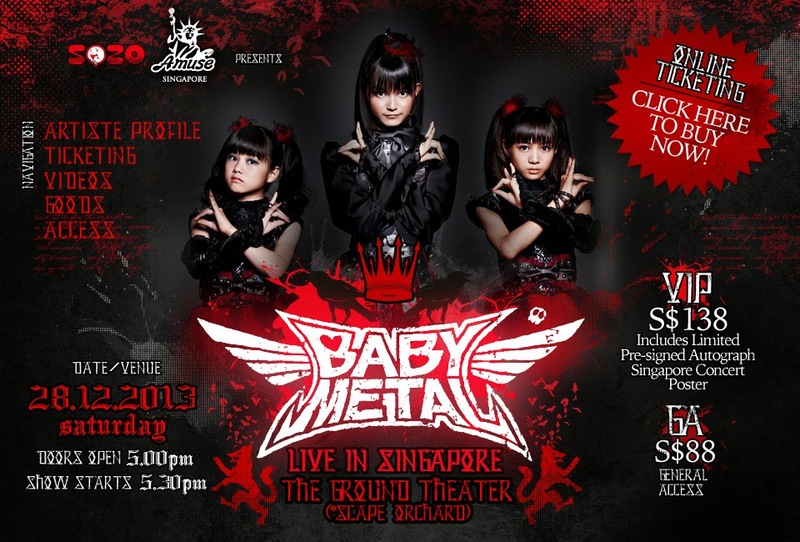 In November 2012, BABYMETAL made their overseas performance debut at Anime Festival Asia Singapore 2012. Finally in December 21st, 2013, they will hold their biggest concert up to date at MAKUHARI MESSE. The tickets have been sold-out within a hour. Then a week after, on December 28th, 2013, BABYMETAL will hold the their first-ever overseas live concert in SINGAPORE. BABYMETAL's "METAL RESISTANCE" around the world is growing larger by the day, at an increasing speed. Tickets prices:S$138 for VIP tickets and S$88 for regular tickets. Never. The film opens November 22 in Japan. Members Su-metal, Moametal, and Yuimetal give their heroes support in a video message shot during their preparations for their first overseas solo live show in Singapore next month on December.